Everyone has their favorite baked mac and cheese recipe… and this is mine. 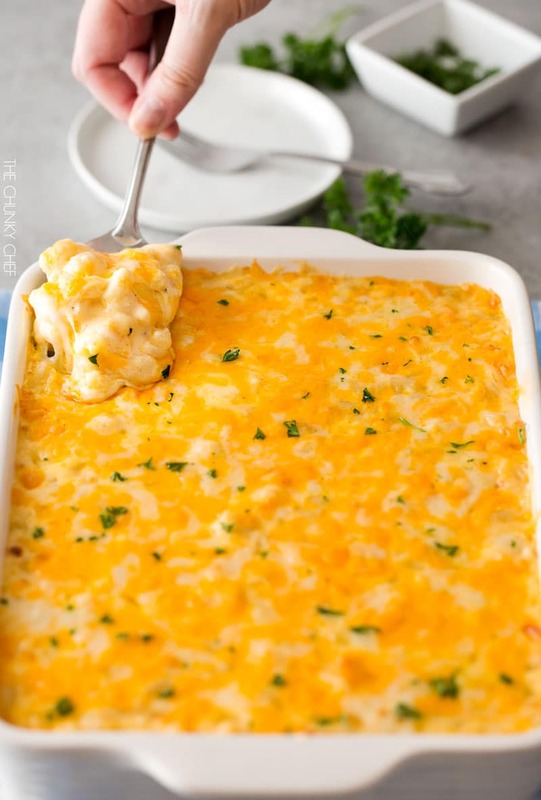 It uses a combination of cheeses, layered in the dish as well as melted into a rich and creamy cheese sauce, for the ultimate in cheesy deliciousness! Baked mac and cheese. It’s nearly the universal comfort food, and there are SO many variations! I have some other variations in the development stages, so expect them to come to the blog at some point 🙂 In fact, I almost didn’t post this recipe today, as there are SOOOO many mac and cheese recipes available, and most people already have their favorite way of making it. Of course, there’s no “right” way or “wrong” way, so I’m here sharing the way I like to make my mac and cheese (the way my family loves it too). It all starts with pasta, cooked about a minute shy of al dente. You don’t want to cook it all the way to al dente, since it will be baking a bit in the oven and will finish cooking there. You can use any shape you’d like. I kept it original here with the classic elbow shape, but I’ve done rotini, farfalle, cavatappi, etc. Pick the shape you and your family love the most! I love to use a mixture of cheeses in my baked mac and cheese… specifically a medium cheddar and Gruyere. The sharp tang from the cheddar and the creaminess of the Gruyere are a great combination! But you could make this with white cheddar, all mild cheddar, sharp cheddar, etc. Even with the tang from the medium cheddar, my kids literally gobble this up! Every time I make it, which is often, they have multiple servings and happily eat any leftovers the next day 🙂 Whenever my kids love a recipe, I consider it a winner! Now for the secret to making this baked mac and cheese SO cheesy and irresistible… the layers. First, there’s the rich and creamy cheese sauce, made with part whole milk and part half and half, with 2 generous handfuls of grated cheese swirled and melted in. Seriously, when you’re cooking this sauce, you might find it incredibly hard to not lick the stirring spoon! Secondly, there’s an inner layer of grated cheese… the secret weapon. Once you add half the pasta and cheese sauce to the baking pan, sprinkle on a generous layer of grated cheese, then top it with the remaining pasta and cheese sauce. You could even be extra decadent and divide the pasta and cheese sauce into thirds and layer in 2 layers of the grated cheese! You could, but then you wouldn’t get that glorious bubbly cheesy “crust”. I don’t know about you, but it’s my favorite part! If you really love that crust, go ahead and broil it for several minutes after baking. This recipe doesn’t bake long at all, but I’ve actually baked it longer before, and it’s still every bit as delicious! Most baked Mac and cheese recipes call for it to be baked 15-30 minutes. My kids aren’t huge fans of the cheesy “crust”, so I bake mine at 325, but 350 or even 375 work as well. It’s a very forgiving dish! I really hope you all give my family favorite mac and cheese a try… I’m sure you’ll love it as much as we do! This baked mac and cheese is a family favorite recipe, loved by children and adults. My version uses a combination of cheeses for a gloriously cheesy dish! Preheat oven to 325 degrees F and grease a 3 qt baking dish (9x13"). Set aside. Bring a large pot of salted water to a boil. When boiling, add dried pasta and cook 1 minute less than the package directs for al dente. Drain and drizzle with a little bit of olive oil to keep from sticking. While water is coming up to a boil, grate cheeses and toss together to mix, then divide into three piles. Approximately 3 cups for the sauce, 1 1/2 cups for the inner layer, and 1 1/2 cups for the topping. Melt butter in a large saucepan over MED heat. Sprinkle in flour and whisk to combine. Mixture will look like very wet sand. Cook for approximately 1 minute, whisking often. Slowly pour in about 2 cups or so of the milk/half and half, while whisking constantly, until smooth. Slowly pour in the remaining milk/half and half, while whisking constantly, until combined and smooth. Continue to heat over MED heat, whisking very often, until thickened to a very thick consistency. It should almost be the consistency of a semi thinned out condensed soup. Stir in spices and 1 1/2 cups of the cheeses, stirring to melt and combine. Stir in another 1 1/2 cups of cheese, and stir until completely melted and smooth. In a large mixing bowl, combine drained pasta with cheese sauce, stirring to combine fully. Pour half of the pasta mixture into the prepared baking dish. Top with 1 1/2 cups of grated cheeses, then top that with the remaining pasta mixture. Sprinkle the top with the last 1 1/2 cups of cheese and bake for 15 minutes, until cheesy is bubbly and lightly golden brown. Make as directed (but do not bake), transfer to baking dish and cool completely. Cover tightly with foil and refrigerate 1-2 days ahead. Before baking, let dish sit on counter for 30 minutes. Bake at recipe temperature for 25-35 minutes, until hot and bubbly. Prepare recipe as directed but bake at 350 or 375 F degrees for 20-30 minutes. Broil at the end of baking for approximately 2-5 minutes, until golden brown and crunchy. I neec to make mac n cheese muffins as an app for a party. Would this recipe work? I haven’t tested the recipe in muffin tins, so I’m not sure if this recipe would be sturdy enough to hold it’s shape. Made this for our Easter Dinner. Made it exactly as stated except i was concerned that the cheeses were not strong enough. I like cheeses that bite back. I happened to find a new product at the market yesterday. They were sheets of Parmesan cheese that can be used as wraps for deli meat, instead of using bread, I put those in between the layers and on top, can you say awesome. Because it was. Thank you for such a wonderful recipe and i have tried many. These look absolutely delicious! You have amazing food photography too :] Thank You So Much for this awesome sharing! This is amazing! We did sharp cheddar, gruyere, and gouda and it was to die for! Everyone asked for the recipe. Made a double batch and it froze very well. Just took this out of the oven. Easter Sunday side dish. Snuck a taste. Yum. I made this last month and used a mixture of cheddar, Swiss, Parmesan and Colby. It was absolutely delicious and also reheats well for any leftovers. I’ve now agreed to make this for Easter Sunday dinner and was wondering if you have any idea on average number of servings? I need enough for about 25. In the upper lefthand corner of the recipe card there’s a green box that says how many servings the recipe makes. Would I be able to freeze this recipe? And if so how long should I leave the casserole out on the counter and how long should I bake for? I haven’t specifically tested freezing this recipe, as freezing dairy can sometimes be a problem. But if you try it, I would thaw it overnight in the refrigerator, and then leave it on the counter for 20 minutes or so before baking as directed by the make-ahead directions in the recipe. Adding ground mustard to this is the only tweak I’ve found that makes the already fantastic recipe better. If you want to give it a try, I recommend a half to a full teaspoon to give it just a little extra flavor. By far my favorite recipe for anyone who says they’re a mac and cheese connoisseur. This was amazing! So creamy and delicious. I have just made it. Really good recipe, favorite of all I have tried, it will be my recipe now. I adapted your wonderful recipe a bit but wanted to say that added the shredded cheese btwn the layers of the pasta & cheese mix is genius! I added pepper jack to the mix for a kick and added breadcrumbs do the top for crunch. Perfect from the first time and the kids loved it. Can i leave the mac n cheese in the oven after baking coz i need to fetch my kids from sch. Will that cause the cheese to dry up or should i just take it out and let it cool? Which is better? Yes, I think you could cover the dish with foil and leave it in the oven after it’s baked. Thank u!! I will try it out! Hello! I was just curious about the water amount in the third step please when it says while watsr is coming to a boil. Thanks! Whatever amount you’d usually use to boil a pound of pasta 🙂 I fill up my dutch oven about 3/4 of the way. We decided to take this and sub out the cheddar for pepperjack, added some parmesan into the topping cheese layer and we also added bacon (one person made the sauce while the other cooked fresh bacon). We also broiled the dish at the end for 5 minutes. This recipe is enough to feed 6 people for sure! Or more if you serve it with something else as a side. We grilled some chicken in a castiron skillet, slice it, and put it on top of our mac n cheese. Delicious! I didn’t have the cheeses listed, so used what I had on hand—mozzarella, white cheddar, smoked Gouda, and the Mexican cheese blend. Followed the directions exactly and topped with cheese and the Italian Panko butter crumbs. I will definitely make again! Thank You! Hi Shirley, I’d read over the step by step directions towards the bottom of the post, as step 7 details that you combine the pasta with the cheese sauce. My son made this in his homeschool co-op so we tried it tonight for dinner. I used 2% milk instead of whole and canned evaporated milk instead of half & half. For the cheese I used sharp cheddar, mozarella and smoked gruyere. I think next time I will leave out the gruyere because it was a little strong to me. Also we used shells instead of elbow macaroni – per my son’s request – that’s what they used in his class. Very good recipe & makes a large dish – enough to share- which is what I am going to do! I’m sure my parents will like it too! I did this once with smoked gouda and honestly wasn’t a huge fan. Go with a regular gruyere next time instead of a smoked one and I think you’ll love the difference! Amanda, this looks wonderful! I’ll try it today. Thank you for sharing! Oh My Goodness. This recipe was so good!!! I was unsure about this recipe because both my husband and my son do not like Swiss (Gruyere Cheese). I will also say that the combination of Swiss and Cheddar seemed “off” to me, but the reviews were so positive I decided to try it. Personally, I get tired of always catering to the “unimaginative palates” of my spouse and son. If my son had his way, we would eat boxed Velveeta Mac and Cheese 5 nights a week, My husband is a meat and potatoes kind of guy. That said, this was a real risk. I decided if they really hated it, I could freeze it and use it for a “shut in meal” or take it to a Bible study group dinner. I made the recipe almost exactly as posted. The only difference being that I had less than 1 cup of mild cheddar/Mexican blend that I wanted to use up that I included into the sharp cheddar mix. After otherwise making the recipe as directed, I added leftover diced ham. All I can say, was it was good the first night, but even better the second day. My husband works second shift which means that whatever I make for dinner tonight, he eats the next night. Both my husband and my son requested the leftovers. OMGEEEE! This is the best mac and cheese i’ve had! Made it about 2 months ago and making it tonight to have with meatloaf! Everyone raved about it! I’ve not used Gruyere cheese before and my store had a hickory smoked one. Thanks for this recipe! It’s a keeper in my book now! 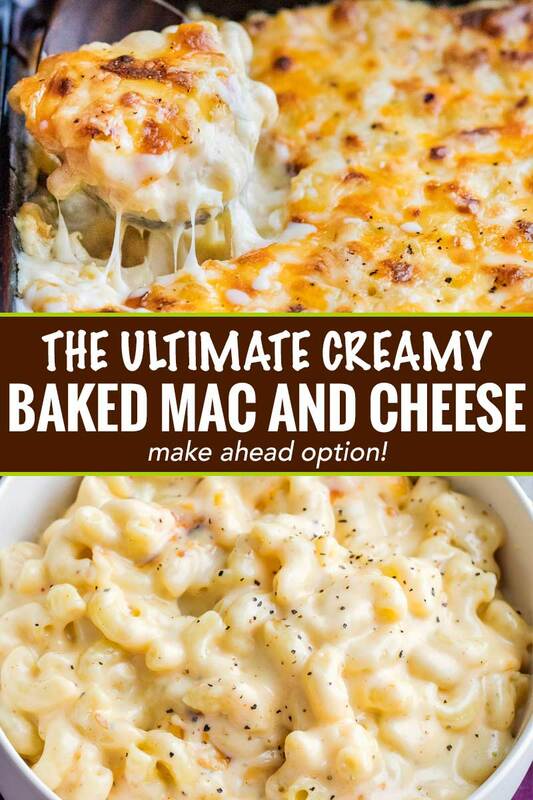 I have searched high and low for “the” Mac n Cheese recipe. This is it!! Love it, my whole family loves it. I topped with seasoned panko breadcrumbs for a little crunch. Amanda, thank you! I made this exactly as recipe states and it was delicious. It has wonderful flavors. Can I use only half and half? If so, how much should I use? Hey there! This recipe looks awesome but can it be baked with bread crumbs on top? Could you tell me what 2 1/2 cups of half and half is please. Half and half is a dairy product here in the US which is part cream, part milk. It’s found in the dairy aisle. If you can’t find it, you could simply substitute with 1 1/4 cups cream and 1 1/4 cups milk. My daughter loved this recipe so much that she requested me to make this for her wedding. There will be 50-60 guests. Can I double recipe and use a larger baking dish? Any suggestions would be so helpful. Has the slow cooker recipe been created yet? I’ve not tested this recipe on that scale, so I can’t say anything for certain, unfortunately. I would assume it could be done by baking it in a larger dish, it just might take a little bit longer. 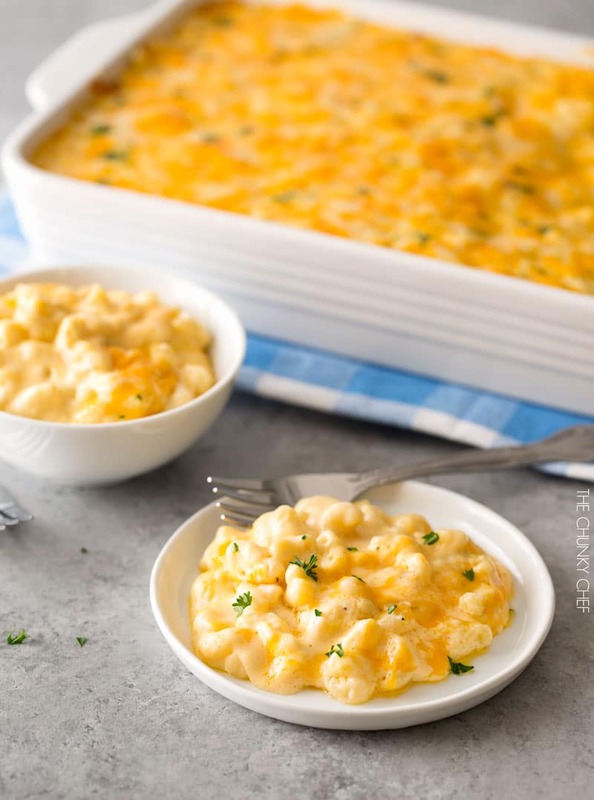 The slow cooker mac and cheese will be an entirely different recipe, as you’d have to add specific ingredients to help make it smooth and creamy in a slow cooker setting. This is so tasty 😋 😋😋 I made 2 batches and ate it all by my self in like 2 hours Yum 😋 like I’m only 300 pounds but boy this is tasty my wife chyanne left me because I ate it all when she said not to eat all of it. But very great and easy recipe if you want your wife to leave you. This was an amazing mac and cheese recipe! We loved the cheese in the sauce and layers! The half and half made it extra creamy. May add the buttered panko next time but this is perfect as it is! Mac and cheese is my favorite food! I want to learn how to do it. We had to do a gluten free version and family LOVED it! I added a gluten free garlic bread topping on top of the cheese. Comfort food to the max!! This is moving into our regular rotation. Amanda, thanks! Made this last night so quick, easy and tasty! I say to cool it down because it will still be hot from the boiled pasta and hot cheese sauce. I haven’t tested it with crab so I can’t say for certain, unfortunately. Loved this recipe…finally a Mac n’ cheese that satisfied my craving. Tried many recipes, and none of them were ever quite “the one”…this was the one! I think the layers made the difference (I really love cheese)! I sauteed some shallots in the butter, sprinkled in some ground mustard in the sauce and also layered bacon in-between and because my husband likes crunch, I topped it off with buttered Pablo! This wad TO DDIE FOR! Thank you! Amanda, this recipe would be perfect for those cold nights. Looking forward to making this for my family. This was amazing. It was a hit at my son’s birthday celebration! I followed the recipe exact, but added a half teaspoon of mustard powder. I will definitely make it again and make two trays next time. I turned this amazing dish into a lobster mac and cheese recipe for the holidays. So delicious! So I made this recipe using cheddar and Monterey Jack back in November and it was absolutely delicious! The best Mac and cheese I’ve ever tasted! Unfortunately the past 2 times I’ve made it I get a really strong flour taste and I am not sure what I’m doing wrong/different. Any tips to help get rid of such an intense taste of flour? Hmm, the only thing I can think of is that you’re not cooking the roux long enough. Once you add the flour to the melted butter, cook it a minute or so, which gets the raw flour taste out. Then go ahead and add the liquids. It is the best mac and cheese! Excellent. I have made this several times. I usually halve the recipe but tonight I did it all. I don’t know if it’s just me but I feel like I could have added more pasta it makes SO MUCH. All I had on hand was half and half. I did two cups of half and half and then I watered down some half and half. I probably could have just used two cups of half and half and water for the rest it gets pretty creamy and thick. I never use the full amount of flour/butter either. I usually toss everything together save for some cheese to sprinkle on top. I usually use smoked gruyere and a combo of cheddars. This is pretty much a foolproof recipe. Sometimes I bake it sometimes I don’t. This recipe sounds tasty, You did an incredible job with this! easy to make and really good with cheese! My entire family loved it, I’m definitely going to try, hope it as good as you do :)) five stars for you and thanks so much for this Amanda! Do you have a slow cooker version of this? I would love to be able to use my crockpot if I could. I don’t, as I’m not sure it would turn out well. But I do have a mac and cheese recipe that’s being developed specifically for the slow cooker coming in the Spring! Thanks for this recipe! I put Panko on top, & a little paprika. Also, a third of the cheese was mozzarella, and the rest medium cheddar. It is great! Ok let me start off by saying this recipe is FANTASTIC. I consider myself to be a bit of a Mac n cheese connoisseur, and I have experimented with many different recipes in hopes of finding “the one”. A few nights ago, my friends and I organized a “Mac n cheese cook off“. There were a total of 5 Mac n cheese submissions (including my Mac n cheese, using THIS recipe). And this Mac n cheese dominated!! Out of the 9 voters that were there, each and every one of them voted for this Mac n cheese. There was no runner up, just one clear winner. And this was it. Although I did make a few tweaks, I did follow pretty closely to the recipe. I was surprised that the recipe did not call for many seasonings, so I decided to add in some dry mustard powder (a MUST for any Mac n cheese recipe!! ), nutmeg, pepper, garlic powder, and a pinch of cayenne. I also added some finely crushed up ritz crackers to the top and set the oven to broil just a few minutes before taking it out. I also added in about 2 tbsp cream cheese (that’s all I had on hand), as I read somewhere that it helps the sauce to keep its creamy texture. Wowowowow. This Mac n cheese was TO DIE FOR. Next time I make it, I would like to experiment with smoked Gouda! I highly highly recommend this contest winning Mac n cheese!! My search is now over. What were the measurements you used for the dry mustard powder, nutmeg, pepper, garlic powder? Just made this and very simple and easy to make. I live in England so we do not have half and half, i just used 2 cups of whole milk and 2 cups of extra thick double cream – Its turned out so creamy and yummy! Followed recipe exactly…except I did not have Gruyere. Substituted Velveeta (yes, Velveeta!) and combined with Cabot extra sharp white cheddar and it was phenomenal. So creamy and delicious. Amanda, thank you very much! I like this! Wonderful combination of ingredients. It look so yummy! Do I need to mix the half and half and the whole milk? I usually do, but you don’t have to. Absolutely delicious!! First time for me to make a homemade mac and cheese. Easy recipe to follow. Could I freeze this after it’s made? I haven’t tested it, but I think it would work okay. I have made this several times. I always make an extra tray and freeze it. Let it defrost and then bake. Do not bake before you freeze. THANK YOU AMANDA!!! This recipe is da bomb!!! My 17 and 13 year olds are extremely picky eaters. I have made various homemade Mac and cheese through the years which my children would look forward to and I can now say the search is over!! When I now say I’m going to make mac and cheese they ask is it the recipe you have made lately? When I say yes, they say oh that is really good mac and cheese. No more box Mac and cheese in this family – YAY!!!!! Thank you again! 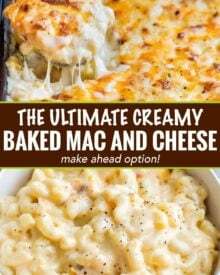 Definitely the best baked mac recipe I have made and I have tested MANY! I made as directed but added some panko crumbs on top. So yummy! Seriously the BEST mac & cheese I’ve ever made! I have been searching and trying to find the creamiest, super cheesy macaroni and cheese and here it is! I made a full recipe for my family of 5 as a side dish but froze half the sauce for another day. It defrosted like I never put it in the freezer and everyone couldn’t stop talking about how delicious it was! Hi Jennifer 🙂 I would cut all the ingredients in half (for a main course dish) and into fourths (to serve as a side dish). Make it as directed, no change to the baking time. That way you’ll have enough for the night you make it, and 1-2 days worth of leftovers. Hello, can you use heavy whipping cream instead of half & half? Tops! All 7 of our family loved this recipe. I especially liked that the littles ate it right up. It was perfectly creamy. The flavor was so good. Do I have to use half and half? Can I just use milk? You can, though it might take a bit longer to thicken on the stovetop. What is half and half? Thanks. Half and half is a very common dairy product in the US, made of part heavy cream, part milk. Simply perfect. Have made this several times and have had rave reviews from old and young alike. Nice job. My first time ever making mac and cheese (minus box recipes) this was the best mac and cheese I’ve ever tasted! It stole the show as a side dish and was the only thing that I had seconds of. So delicious! Best Mac & Cheese I ever made! I made this dish for a party, and the guests were begging for more! Wish I had made two trays. For first-time makers of this dish, it will seem like A LOT of cheese when you’re done shredding, but follow the directions exactly as written (especially when whisking the sauce) & you’ll be in Mac & Cheese heaven! I used four, 8 oz blocks of sharp cheddar and two, 8 oz blocks if Monterey Jack. SOOOOO yummy!! I added crumbled 1 cup each of bacon, cubed ham and cubed andouille to this recipe. It worked. I made this tonight! My family and I are calling this McComfort Food! Delicious and filling! Tried this last night and it was a hit! This is the first recipe I’ve made that doesn’t get too dried out. Thank you! But now this begs the question, what’s the best way to reheat our leftovers and keep the creaminess?? I’m so glad you loved it! Mac and cheese is notorious for becoming greasy when reheated, and this is no exception. I’ve found reheating it in the oven or on the stovetop helps keep it the least greasy though. I have made this recipe a number of times for my family. We LOVE it. Thanks so much for sharing this wonderful delight!!! Help! Is the salt for the sauce or for the pasta? I used what cheese we had on hand and it worked out perfect. We couldn’t get enough of it. Making it again today, so I came back for the directions again. Thank you so much for the recipe and all the tips. This recipe has caused unprecedented martial issues in my home! I made it once for my wife (yes, I am a man and the kitchen IS my domain… deal with it!!!) and now about once a week she comes home with a big bag of cheese, macaroni, etc. and insists that I make it for her! Fortunately, its one of the easiest things that I make and when she’s happy I’m happy! I even keep a spare in the basement freezer that she never explores which makes it even easier. I add chunks of ham to mine as well. Just made this recipe and it was, in one word…DELISH! VERY EASY recipe to make. I stuck with the original gruyere and cheddar mixture. My store only had smoked gruyere and I was a bit worried but it added a really nice smokey flavor that paired well with the ribs. Obviously this is only an occassional treat as it chock full of cheese, butter, half and half and whole milk…but for a once in awhile indulgence, I’ll definitely make it again! For once the recipe I attempted came out perfectly. This mac and cheese is the best in the whole world..I know this because my son and husband said so, and I agree. I cooked it exactly according to the directions and baked it on the 350 setting for 30 minutes and then broiled it, because we are fans of the chewy cheesy crust topping. Thank you for sharing. This is the very best Mac and Cheese! I’ve made it several times, each time varying the cheeses and some of the additions/substitutions that others have commented on. The last batch, I doubled, using mild cheddar, sharp cheddar, Velveeta, mozzarella and gruyere. Then followed the recipe exactly, using shredded cheeses for the topping. HUGE HIT for our party. I’ve never tried using cream cheese or Brie as one of the cheese selections. Has anyone tried those? Many thanks, Scotland don’t stock half and half in our stores. When you live in a little villiage and i mean LITTLE we dont get luxuries like yourself. I’ll try double cream with full fat milk……we have two grocery stores. TESCO and CO-OP. we don’t even do fast food. Is that full fat or semi skimmed?. Will let you know if I’m successful. What is half and half?…. Half and half is a dairy product found in all grocery stores. It’s a mixture of heavy cream and milk. OMG!!!! This is the BEST mac and cheese ever! It has the perfect consistency and so creamy. It was a big hit and absolutely no leftovers. Thank you very much! I made this recipe because there was an aged cheddar on sale at the grocery store. I could not have imagined a better use for this cheese. I also used some asiago on hand. My husband, coworkers, I absolutely loved it. I just made this (my first attempt at mac n cheese) and it turned out perfect! Thanks for sharing. I made this tonight,and it definitely was a hit! Will make it again for sure. Thank you for sharing your oh so delicious recipe! The recipe is good but I cut everything connected to sause and topping in half (cheese, butter, milk, cream etc) – and it turned out great! Just the right amount of creamyness and cheesyness. Made this tonight. Only had American and Cheddar cheese, used Italian bread crumbs on the top but followed your instructions. I have make home made Mac and Cheese with wonderful results but this with the paprika and a bit of garlic powder….Wow! Wonderful. Made it for the first time tonight. It is a keeper! Could never find a great mac & cheese recipe till now. I made this for the first time last night. It was fantastic, and I almost want to say the leftovers are even better if that’s possible. Keeper for sure! made this for Christmas eve using sharp cheddar and swiss… it came out wonderful. Baked it right in the warming trays, it came out wonderful and didn’t dry out in the warmer either! It’s my new “go to” for Mac and cheese! I made mine with 4 different cheddar cheeses and smoked gouda and it was absolutely the best! I went very well with my smoked brisket and baked beans! This came out very well ,it looks delicious and I will try it again , maybe with some bacon . I made this recipe for a potluck & it was a big hit! I’m making it again today for New Year’s! Thank you for sharing this wonderful recipe. I’ve made this before and baked it and it’s delicious!! My husband liked it better before I baked it. Can I make this up until the baking part and hold it in a warm crock pot for a party? Will it separate after a couple hours??? I haven’t tested it that way, so I can’t say for certain that it won’t separate. I would think as long as you stir it occasionally, it shouldn’t separate though. Best homemade Mac n cheese recipe! Loved loved loved this recipe! My family and I were out of town for Christmas and we voted on making a home made mac n cheese as a dinner side. I have made other recipes in the past and they were always just “meh”. When this one came up in the search and I saw who made it, I just knew I had to try it! I ended up reversing the cheeses (4 cups of Gruyere and 2 of Cheddar) because that’s what was had on hand and it was so fantastic! It was even better as left overs! The cheese sauce turned out perfect and was not at all greasy (probably because we switched the cheese amounts.) I served it with toppings of red onion, bacon, and avocado and again, positive reviews from a very picky foodie family! Thank you for sharing your amazing recipe! This is my new favorite mac n cheese recipe now! I did three layers and used the whole wheat elbow macaroni. I made it for our Christmas dinner and everyone loved it. I have requests to make it again. The combination of Gruyere and extra sharp cheddar is amazing. My husband is eating the leftovers now and all I hear are oooohs and ahhs. I’m confused. The recipe ingredients calls for 1 1/2 cup of milk and 2 1/2 cups of half and half, however when I read the instructions you only mention using 2 cups total. Very confusing, what about the other 2 cups? The next sentence in step 4 says to pour in the remaining milk/half and half. You add the liquid in stages so it develops into a smoother sauce. She mixed the two milks. She poured in 2 cups of the mixture, mixed it into the butter and flour mixture, then she poured the rest of the milk (that would be the other 2 cups of mixed milk). This recipe will be a hit for my next vacation. Made this for Thanksgiving and family said that this was the best dish of all (over turkey, mashed potatoes, stuffing, etc..!) Then made it for Christmas and they all went on about how this needs to be at every family holiday. It’s such a hit! The only thing I added was “garlic and cheese” croutons – smashed up – on top before baking to add a bit of flavor and crunch. Best ever!!! Wrote my review but forgot to rate all the stars possible!! As many others below I made this for Christmas dinner and it was the a HUGE HIT!!! Saving as my go to recipe from now on!! Seriously the BEST Mac n cheese I’ve ever made! I can’t find Gruyere cheese anywhere does anyone know a good substitute? This recipe turned out so well and was super easy. Its taken me so long to find a good mac recipe and I’m so glad I made this one. I served it at a big work Christmas party and it was a huge hit. This recipe was a hit at my family’s Christmas dinner this year. Slight variations I Made due to what I had available: 1.5 cups half and half. 1.25 cups 2% milk and .5c heavy cream. Added the beau monde seasoning with the spices and topped with bacon chives and Italian bread crumbs. Best Mac and cheese I’ve ever made. Thanks! I never write reviews but this time i had to. I’ve followed other mac n cheese recipes and this is by far the BEST MOST AMAZING mac n cheese recipe ever. Very creamy, not dry at all. Great taste . I made it today for Christmas and everyone loves it! Thank you for sharing your recipe. I made this macaroni and cheese for Christmas Eve. I followed the recipe closely, but added 1/2 teaspoon of garlic powder to the sauce. It was fantastic. My brothers are very picky when it comes to mac and cheese, and they both loved it. Thanks so much! Finally! My grandma made the best Mac n cheese ever. I’m 56 and have never been able to make a decent Mac n cheese until this recipe. Made for the family on Christmas Eve and got lots of compliments and I loved it as well. I did add a little more milk than called for and also added a little bit of Velveeta in the layers. Will only use this recipe from now on! Made this today for Christmas tomorrow! me to!!! cant wait to eat it. I made this for Thanksgiving and loved it. 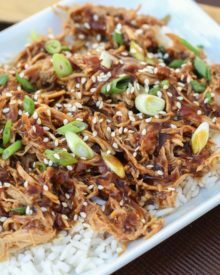 Have you ever tried this same recipe in a crockpot? I haven’t tried it, so I can’t say for certain if it would work. I just made this for a party thing at my job and doubled the recipe and it was amazing. I wasn’t even sure I was doing it right because I doubled it but came out great. I subsisted the Gruyere cheese with this “Mac and cheese” blend at Stop & Shop becusss they didn’t have the Gruyere cheese and it wasn’t surprisingly good. My boss and even some co worker was saying they loved it so much . Is this to be baked covered or uncovered? You can do either, but I usually bake uncovered so the cheese on top crisps up. I made this for my five grown up children who were home for a long Christmas weekend. It was a huge success! Easy to make with very few ingredients. I am not sure where to buy the Gruyere cheese, I have been to Wal-Mart, Fred Meyer, and Natural Grocers! Can you tell me where you buy this cheese? Both my local grocery stores carry it, sometimes in the “gourmet” cheeses area. You can substitute with swiss or smoked gouda if you can’t find it. My Kroger had it in the deli. I just had them slice me a big chunk and I grated it at home. My sister in law made this for Thanksgiving and it was a HUGE hit! I just finished preparing the make-ahead version and plan to bake it in the morning and transfer to my crock pot to keep warm for a work potluck…fingers crossed! I made your recipe as written substituting only Swiss cheese for the Guyere. I taste tested it before baking and it was fabulous. When I baked it, it still tasted great but the cheese was very stringy and not the smooth texture of the cheese sauce that I mixed into the macaroni. Is this dish normally very stringy after baking? If not, any ideas on where I went wrong. Thank you. It sounds like your cheese separated a bit during the baking process. Completely melting the cheese into the milk mixture will help reduce the probability of a grainy sauce. Also, definitely grate your own cheese (not sure if you did or not), and if you’re having trouble with creaminess, try using room temperature half and half and milk, and room temperature cheeses. My wife is gluten free, I have had really good success with substituting the 1/2 cup flour and about 1 cup of half & half the past to make the cheese sauce with 8oz of cream cheese to make Alfredo in the past. Any advise for this recipe? Should I just stick to GF flour instead using an Italian knock-off solution? Thanks! well its for a party so since we have other food i figured just one serving for everyone would do, so i doubled it. it seems just about enough but we’ll see 😇 it tastes good before baking but my only problem is that im scared it’ll dry out by the morning. will it turn out fine once i bake it ? You probably had your party by now😄 but I made mine the night before to bring to a party the following day. I refrigerated it with foil on top & we re-heated it the next day before the party and it was AWESOME! Nice & creamy & not dried out. Everyone LOVED it! Can you make cheese sauce & pasta ahead and refrigerate separately to combine on day of baking? That should definitely work, just make sure to heat up the sauce some before combining and baking… and stir the cheese sauce really well after it’s warmed. The sauce may separate a little bit, but should come together with a good whisking. Can you use all milk instead of half and half? So many times I see “best” in front of a recipe, I’m let down and it’s not in fact the best. But WOWZA this mac and cheese is hands down 1000% no doubt THE. BEST. Made it exactly as written and it was perfect. 2nd time I grated in 3 cloves of garlic into the milk mixture and picked a higher quality gruere cheese and it was just mind blowing! Absolutely delicious! Thank you so so so much for this amazing recipe. Would you recommend hand shredding the cheeses? Do you see any benefit over just buying already shredded? Also, just out of curiosity…why half and half vs. heavy whipping cream? Does it get any less creamy (do the noodles soak up the liquid and dry out) if you make it the night before and heat it up the day of? All I have to say is AMAAAAZING!!! This is by far the best Mac n cheese recipe I’ve ever made. I just made it for the family and they loved it!!! Thank you for sharing. This will be my go to recipe from now on. I’ve never tested this recipe in a crockpot, so I can’t say for certain that would work. Usually crockpot mac and cheese recipes use different ingredients. If I were you I would bake it 🙂 Good luck hosting!! Meeeeee toooooooo! Let me know if you figure it out, please! Help how do I store this? It should keep for a few days in the refrigerator (covered). Has anyone ever added lobster to this recipe? Lobsterman here! They’re pretty easy to add in, just boil some water (outside if you can as the process smells a bit) add “the bugs” or lobsters, and dont forget to take off the rubber bands on the claws! Unless you like the rubbery taste. Boil for 8 or 9 minutes if you’re talking an average 1.25lb lobster, until they’re bright red. Pick out the claw and tail meat, dice it into bite sized pieces and toss it in once you’ve brought together the pasta and cheese sauce. Thank your for the response to adding lobster. I made it for Christmas and it was a hit. I actually steamed 4 lobster tails for 8 mins. I cut them into pieces and layered the pieces in the middle of the pasta cream sauce mixture. It came out great. I’ve never made this with cream cheese, so I can’t say how that would affect the taste, but you could make it with 2 1/2 cups half and half and 1 1/2 cups heavy cream for an extra rich dish! If I use 2lbs pasta versus 1lb as in recipe do I just double everything? Absolutely delicious! So good I made it twice in a week for different audiences, it was a huge hit both times! I added pancetta, substituted fresh cream for the half and half and added a dollop of Dijon mustard but otherwise stuck to the recipe. Best mac n cheese ever! Yes you can! Make the mac and cheese, but don’t bake it. Then cool completely and freeze. Thaw overnight in the refrigerator, then bake at 325 or 350 for around 30 minutes, or until hot and bubbly. Oh yeah, I forgot to mention that I always prepare it in one of my cast iron Dutch ovens. 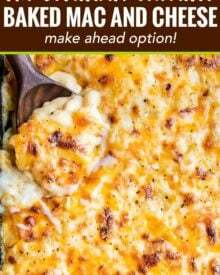 This is by far the best mac and cheese recipe i have ever encountered! I mixed the bread crumbs with melted butter and spread it on top of the mac and cheese and it browned in the oven. Very creamy and yummy! I’ve tried so many Mac and Cheese recipes over the years and finally found a winner! 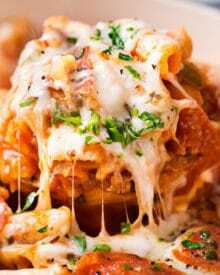 I Followed the recipe exactly and topped with grated cheese, my family absolutely loved this and so did I! Can’t wait to add this dish to my next Holiday party! What a talented lady, so glad I found this website and this recipe! 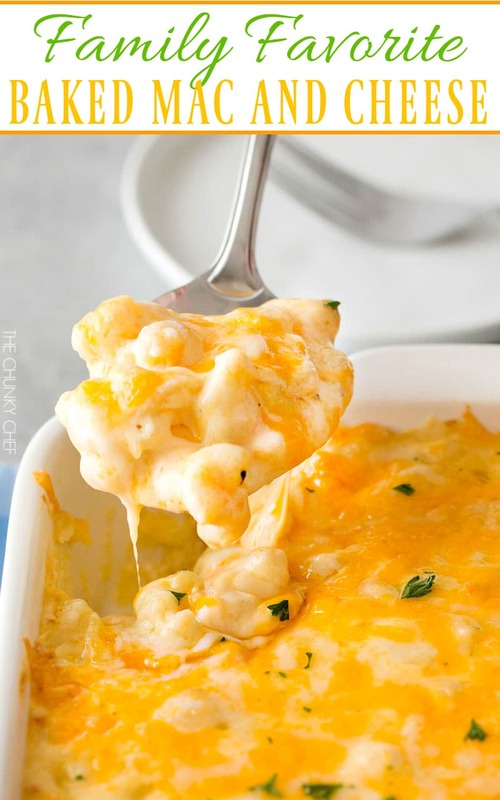 Amazing Mac and cheese recipe! Thank you for sharing with us!!! I give 6 out of 5!!!! That good. I made it for my daughter’s school potluck, it was the most popular dish there. This is so delicious! I double the recipe (yes, it’s a lot) for our monthly potluck. It doesn’t matter how much it is, the dish is invariably SCRAPED clean, not a noodle or cheese bit in sight. Heaven forbid, that I should bring anything else, if I do they ask where that wonderful mac and cheese is. I just gave up and I make it every month. Made this for Thanksgiving and it was a huge hit! We reheated the leftovers for two additional meals and still delish! I used sharp white cheddar , gruyere, and mild cheddar. Will definitely make again! I made this dish for Thanksgiving and it was defiantly a hit, so amazing! I do have a question though, I was wanting to make it again but not bake it. 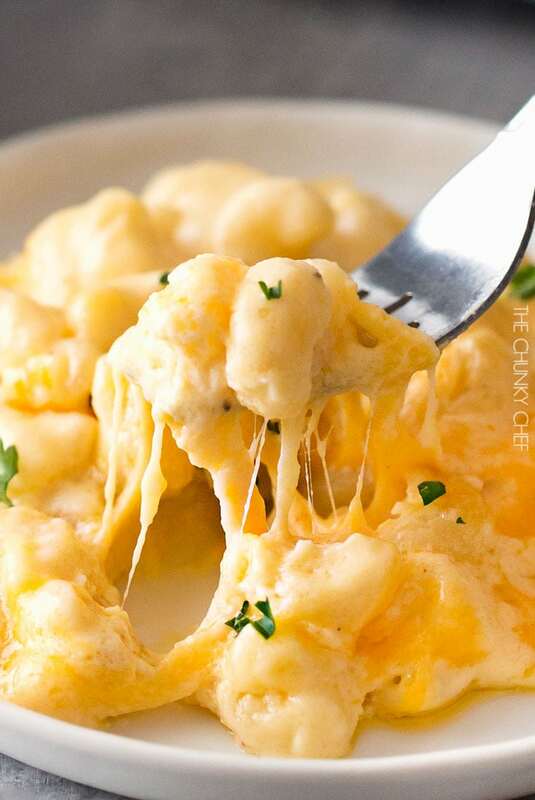 When doing that do your just mix all 6 cups of cheese into the cheese sauce or how do you handle that? Thank you in advance!! Made this for my family for Thanksgiving and they loved it! Thank you for sharing! My entire family enjoyed this. I used “1 cup” gruyere, “1 cup” Muenster, and “4 cups” sharp cheddar. Those are in quotes because I actually used much more! Haha. I used whipping cream instead of half and half. It was just soooooo good. Thank you! I absolutely love this recipe but recently doubled it and made way too much. Have you ever tried freezing it and the reheating/ baking? So glad you love it! I haven’t tried that so I can’t say for certain how it will go. This recipe was perfect! Made it for thanksgiving and everyone loved it. Thanks for the great recipe!! did you use the exact ingredients? If so, how much did this feed? Was looking for homemade mac & cheese recipe and found this one. Took a chance and made this on Thanksgiving for everyone. Went with the five cheese option. Came out perfectly and everyone absolutely loved it! So amazingly creamy and smooth! Thanks for a great recipe. Because of this super Mac and cheese dish (I made it according to your recipe, finishing with a short broil for the crust) I have been forgiven for the squash dip I made last Thanksgiving. I’m going to make it for Christmas too! This recipe super rocked our thanksgiving dinner spread. I used the suggested cheese variations and I substituted paprika for smoked paprika and added just a lil cayenne for a hint of kick. My family loved it! It will continue to be my go to Mac n cheese recipe. Thanks!! Thank you for posting this recipe. Made this for Thanksgiving and it was a hit. Came out exactly like the pictures. I used 3 different cheeses and added a little garlic powder and mustard powder to the sauce. Baked it for 15 minutes and switched to broil for another 2 minutes and it had the perfect crust on top. I’m definitely making this again soon, my kids loved it. I found this way fit me by using mid cheddar with rotini. My little sister is really in love with this. I see some try with milk comments, but what kind of milk for the best taste? Thank you by the way! please help me, i see in your recipe it says 1 1/2 cups cheeses but it does not specify how much of each. If i follow your recipe exactly how much cheddar vs gruyere am i supposed to use in the sauce and layered? In step 3 of the recipe, it details how much goes in each layer/sauce. Just wanted to post a “thank you” to the author. I normally follow my own recipe but decided to try this one for Turkey Day. I made 1-1/2 times the recipe for a dinner for 12 ahead of time the night before, putting a small amount in a dish in the oven to “sample” the evening before just to taste. I used mild cheddar, sharp cheddar and Gruyere cheese (lucky my local market had cave-aged Gruyere on sale for $5.00/lb!) Folks, shred your own cheese, don’t use the pre-shredded stuff. It melts better and is fresher, easy enough to do if you have a food processor with the blade. I really recommend you *don’t* make it the night before. The sample dish we made was so much better. Don’t get me wrong, the dish we served drew rave reviews, one guest saying it was the best mac and cheese he ever had. It was very good, just not as good as the fresh test pan we made the night before. Next time I will top it with bacon and sauteed onions. 2 of my guests don’t eat pork so I had to omit. I made this yesterday for Thanksgiving dinner and it was a hit! my daughter intended to take what little was left, but she forgot it on the counter.. I was going to call her and let her know, but I remembered that her phone was dead.. she text me when she got home with a crying emoji saying that she forgot it and asked if I could bring it to her tomorrow.. she lives an hour and a half away, it wouldn’t survive the trip. Wanted to try a different Mac & cheese recipe this year, yours ROCK IT!!!! It was great!! Super easy to make. Abmsolutely delicious! Very easy and super delicious! A hit for our Thanksgiving, thank you! Topped mine with shredded cheese as per recipe, plus buttered and herbed bread crumbs. Yum! This was delicious, easy to make and makes plenty, and also came out beautifully. I used sharp cheddar and muenster. Very please. Thankyou! Can I sub swiss for gruyere? What about pepper jack cheese? Could I use heavy cream instead of half and half? If i only have 2 cups of cheddar worth an 2 cups of mexican blend cheese would that still work ? If not i also have mozzarella so how would i split all 3? For the extra cheesiness I’d add the mozzarella, and do 2 cups of each of the 3 cheeses. I the Gruyere was sold out everywhere so I substituted Gouda. Will is still taste good? 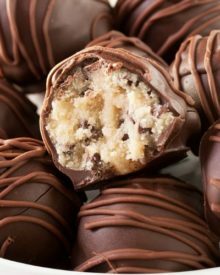 Just made this following your exact recipe with extra baking time… amazing!! Thank you for sharing, its an ansolute hit. So if I dont have the 2 day head start will it still be okay or should I just try a different recipe?. You can definitely make it right away (that’s actually how the recipe was written), I just shared the make ahead directions for people who DO want to make it that way. best brand of half & half to use? I am making this right now for Thanksgiving. Looks delicious. Gruyere cheese was a little pricey and hard to find, but I think it will be worth it. Always looking for a creamy macaroni and cheese recipe, so hope this makes the cut!!! Will let you know tonight!!! Happy Thanksgiving Everyone!!! Made this recipe and added a little of my own ingredients….came out excellent! Thxs. Gouda, smoked cheddar, mozzarella, colby, pretty much any cheese will work. Do I use both the half/half and the whole milk? What herbs would you mic with the Panko bread crumbs? 😁 making this today! I’d do a little parsley, thyme and smoked paprika if you have any! I skipped the salt in step 6. I thought the measurement of salt was for step 2 (boiling water). Anyway to add it after the fact? Can I use evaporated milk? I was going to make another Mac and cheese recipe but came across yours and yours looks WAAAAAAAY better. I haven’t tested it that way, but as long as you have enough of the evaporated milk (4 cups worth), I think it should be just fine. Hello. I’m making this recipe for thanksgiving tomorrow and I asked my mom to get the cheeses for me. She got sharp cheddar cheese that was aged for 6 months by accident. Will that still work? This looks absolutely delicious! I am making this tonight – hopefully. I usually only buy 1% or 2% milk in our home. I realized it is saying whole milk. I have all of the other ingredients mentioned just do not have whole milk– will that make such a big difference? I wish I commented earlier haha as Thanksgiving is tomorrow and the dish is for well tomorrow’s dinner. I just made this for the 1st time. It is sooo delicious. I didn’t have gruyere, so I subbed Munster. It’s mild and creamy and I thought it might work. It did! I am going to serve it tomorrow. Thanks for the yummy recipe! Amazing recipe! I tried it out (exactly per your recipe/oven) for my company’s potluck today. I am not kidding when I say everybody, and I mean anybody who tried it, ALL raved! Said it was fire, on point, amazing, delicious, and so much more! Thank you for posting this. I was ready to buy the family size deluxe boxes of Mac ‘N Cheese and call it a day until I stumbled across your recipe, and boy am I happy to have stumbled. I learned A LOT from your recipe. Never have I ever used Gruyere cheese, which is now my fav thank you, and I must say it is magical regardless of the sticker price. It was worth it. (I doubled the recipe for my potluck and am making it again for my family tomorrow. I will also be doubling the recipe for my family, but I am making two of the double recipe which is why I say Gruyere cheese is pricey.) However, I would spend it all again because it was definitely worth it. I cannot wait to make it again. Thank you, thank you, thank you for sharing! This will now be apart of my family’s go to recipes. Awesome recipe! There are a lot of steps involved, but if i can make it, anyone can! Made it for July 4th for the first time and it was a hit. Everyone is asking for this on Thanksgiving tomorrow! Just put this together and keeping it in the fridge until Thanksgiving tomorrow! I gave it a taste before covering it and OMG!!! So delicious and it’s not even baked yet! Can’t wsit!!! Can i use colby cheese instead of the gruyere cheese?? Can you use mozzarella cheese instead of the Gruyere cheese because I couldn’t find Gruyere anywhere. What can I substitute for the half and half? Only have milk on hand . Milk will work, just might take a bit longer to thicken up. I would use cooked and crumbled bacon, otherwise it’ll be really greasy. I want to make this today for thanksgiving but I do t have half & half. I do have whole milk and buttermilk on hand as well as cream cheese. Can I make this recipe work with that? Would it be a sin if I added half a can of cheddar soup? I’m looking for extra sauce and creaminess has anyone tried? Not a sin… I’ve never felt it needs any extra creaminess, but feel free to try it. This recipe looks Delicious! Making it tomorrow for Thanksgiving. One question, Does the milk and half & half need to be warm when adding it to the roux or can it be cold? I usually leave them sitting out (in the measuring cup) on the counter while I’m cooking the pasta so it takes the chill off of them. Your baked mac and cheese’s version so wonderful!! I made it on Sunday! And my family ate it many times in one day without any complaints!! I was so happy! Thank you so much!! Hi this looks great was wondering if I could make this with just cheddar cheese. You could.. may not be as gooey, but will still taste amazing. Hi! I like American cheese. Think I could do it with American and cheddar? This looks fabulous!! Sure thing, that would be tasty! I am going to make this on Thursday. So excited. My issue is that so only have one 9×13 pan..and that’s reserved for the green bean casserole. My question is is it okay to make in a foil pan? If so, do I need to adjust the cook time? Swiss or smoked gouda would be a good substitute. Yes, all cheese is grated, per the recipe and instructions. Can you add egg to this dish????? Growing up, I’ve always seen people add an egg to the mixture. Typically mac and cheese recipes that use egg to bind all the ingredients together don’t use the flour and butter. This recipe uses a roux (butter fat and flour mixed together) to thicken the sauce and bind the ingredients together. So I can’t say for sure if adding an egg would negatively impact the recipe or not, but I wouldn’t recommend it. I haven’t personally tested it, but you may want to scroll through the comments and see if any other readers have successfully done it. I have made this recipe baked as directed to do but I want to take it to a carry in for work & I work in a factory where bringing a crock pot is more ideal. Could I put this in a crock pot on low or keep warm & it be okay? I haven’t personally tested it, so I can’t say for certain, but I *think* that would be okay. You might want to scroll through the comments and see if any other readers have successfully done it. I just made this recipe this morning for a work potluck and I made it in a crockpot. However, I made it slightly differently in order to keep the oven-baked goodness. The stoneware from your crockpot may be oven-safe (Crock Pot brand ones are), though they aren’t broiler-safe. So, I made the recipe like normal, then poured it into the crockpot stoneware and placed that in the oven for about 20-25min @350degrees. Then, when I pulled it out of the oven I placed it into the heating base and took it in to work. Once at work, I plugged it in and left it on Low for a while, then reverted to Warm. Based on comments from coworkers it was a success! The last few times I’ve made mac&cheese, I’ve done it this way to reserve the crunchiness, but still have it in a functional, travel container which can keep it warm. It’s become my go-to method these days, particularly if it’s not for a meal at home. While I’ve not yet attempted this recipe (though I plan to tomorrow), with other baked mac&cheese recipes, I’ve used a Crockpot as well. However, I’ve done a variation from your suggestion. The stoneware portion of your crockpot “should” be oven-safe (Crock Pot brand says theirs are, maybe research to be 100% sure). I’ve made the recipe and just poured it into the crockpot stoneware then placed it into the oven for the desired length of time. Then, once it’s out of the oven, the stoneware can be dropped right into the heating base and you can turn it to warm or low to keep it warm and gooey for as long as you need. 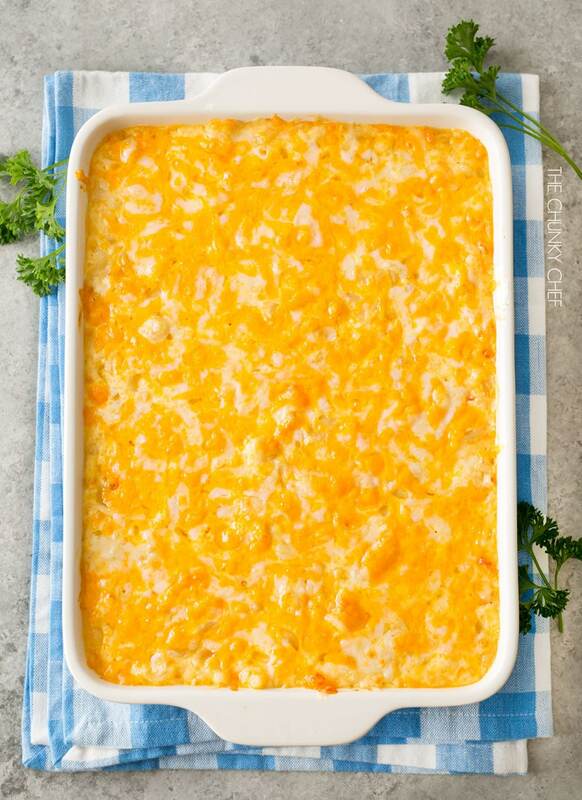 This has helped me out for potlucks and family gatherings where I wanted the baked texture but wanted to be able to keep it warm for a time as well. Hi! I’m planning on using this recipe because of all the raving reviews for a potluck and saw it feeds about 8-10 people. Any recommendations on ingredients to feed around 15? I would just double all the ingredients and cook in a very large foil baking pan (or cook in 2 separate 9×13 pans). What can i substitute all purpose flour with to make it gluten free? Thank you! I don’t have any experience with gluten-free products, so you might need to do a google search and see what a good substitute would be. Do u add the milk and half and half together in the pan? I read the secret to creamy macaroni and cheese is to cook in stovetop and not to bake it. Can I use your recipe but cook on stovetop. I dislike a crunchy top and a casserole like consistency. Thanks so much! Recipe seems simple to follow, but I’m curious as to why flour is added? 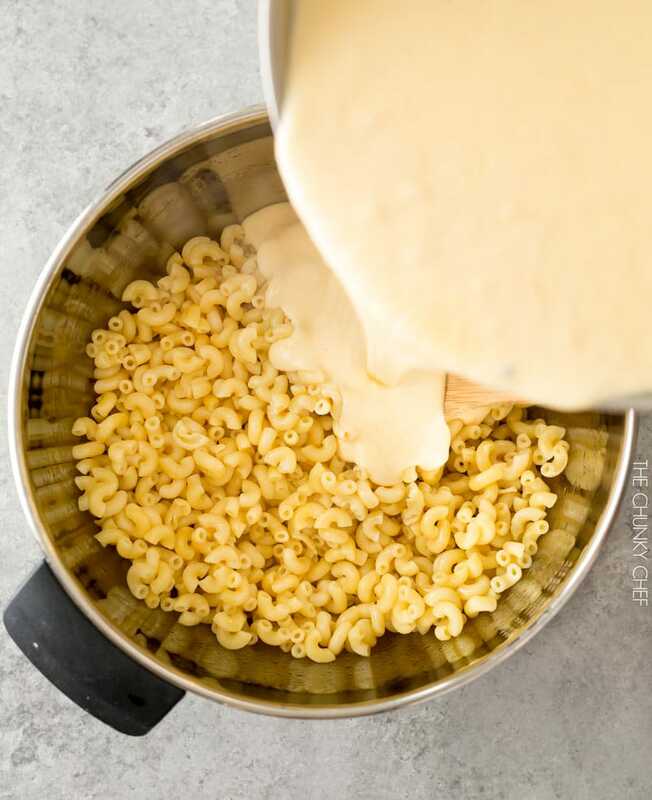 Flour is added to the melted butter to form a roux, which thickens the half and half and milk to make a thick cheesy sauce. Self rising has leavening agents in it… I would probably use all purpose, unfortunately. Hello. This recipe appears delicious and the desired “creaminess” I cannot find with others. I intend to make this as a side for thanksgiving. A quick question. I make another mac and cheese with a smoked cheddar and smoked paprika as I like the smokiness taste. Will this flow well with the Gruyere cheese? I’d plan to use 2 cups smoked cheddar, 2 cups sharp cheddar, and the 2 cups of Gruyere. One more thing – if I top with some Panko bread crumbs should I bake them with the dish or add them after baking? Thanks a lot! Love this recipe! I made it for Thanksgiving last year and this year my in-laws told me they couldn’t WAIT for my Mac n’ cheese again. Eekk! So glad I found the recipe again, I’ve tried many but I will stick with this one from here on out! Thank you for sharing! Does it matter what kind of Gruyere cheese you buy? I wouldn’t think so… my store only carries aged gruyere. Thanks for the tips! I think I’ll try just broiling it next time. I plan to make it for thanksgiving because it was a delicious and an easy recipe to follow. The kids loved it last time despite it being on the dry side, so it’s still a winner in our house either way! There’s a bright green box in the upper left-hand corner of the recipe box that says how many servings are in each recipe (8-10 servings for this recipe). What are the herbs you used ? I noticed green in the pic what is that ? Cilantro, parsley, or ? So delicious!! I used an apple smoked gruyere as a “secret” layer. It came out great and everyone loved it! Thanks for sharing your recipe! 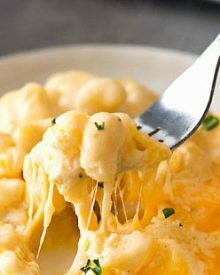 I have tried EVERY mac n cheese recipe out there to try and find the right amount of gooey cheesiness and pasta heaven. I even tried NYT recipe that used cottage cheese and mustard, etc. But THIS recipe has been our favorite find and we will not use another recipe again. My children loved it. And they are picky teenagers. (One is even in culinary school). I made it last Thanksgiving and all the guests loved it. The gruyere and half and half are the magic to this dish. The gruyere can be a bit stinky but it is oh so yummy! Thank you, thank you for this recipe! This is the Mac andCheese recipe I have waited for my whole life. It is the bomb.com Thanks for shar8ng. Can I make this in the Crock-Pot? I haven’t tested this recipe as a crockpot recipe, so I can’t say for certain. Have made this dish twice now for work events and it’s always a hit! Was trying different recipes for my husbands office party and this was by far the best! Easy to make AND delicious! Took the trial run over to the in-laws and they took some for the next day! Now I’ve been told to bring it to Thanksgiving too! Have you ever assembled this dish a day prior and baked day-of? Would like to try for Thanksgiving but there’s SO much going on that day – I’d hate for it to dry out before we eat it so was curious what you thought about that – thank you! I used fresh grated gruyere but pre-grated cheddar. Could that be it? Most mac and cheese recipes that use “real” cheese and not velveeta or other cheese products will lose the creaminess the longer they sit out without being heated. You could always use a little more liquid and make the sauce a tad looser, but any dish that sits out for an hour will be different than when freshly baked, unfortunately. Can I make this and then put it in a slow cooker for a work party? I don’t want it to get dry. Thanks! I haven’t tested it, but I think it could work. I would maybe add a little more liquid so the sauce is a tad looser before it goes into the crockpot. I made this recently for my grandson’s birthday celebration and my son said it was the best he had ever had. My husband has requested it for dinner again tomorrow. I used a combination of sharp cheddar, Monterey Jack, and parmesan cheeses, as that is what I had on hand. I grated the cheeses – – – did not buy packaged. I think this makes a big difference. I also added 1 tsp. garlic powder and 1/2 tsp. onion powder to the spices and used a bit less milk than the original recipe. It came out creamy and perfect! This recipe was awesome! I opted for a mixture of cheddar and jack cheese because I was worried my daughter wouldn’t like the gruyere and I’m cheap haha. I’ve tried my hand at homemade mac and cheese a couple of times and just haven’t been impressed. This is THE one. You’ve definitely ruined the boxed stuff lol, thanks! Everyone LOVES this!!! BEST MAC RECIPE-By FAR! GRUYERE is in fact pretty expensive, but I’m guessing it’s the star of the recipe. I have already made the recipe twice. Thank you! I haven’t tested it, so I can’t say for certain. I’m making this for a family gathering, and so I doubled the ingredients. However the gruyere was expensive so I purchased mozzarella to sub for 2 cups of the gruyere. So total it would be 8 cups medium cheddar, 2 cups gruyere, and 2 cups mozarella. Will this work? After getting home I’m beginning to second guess it. This was so delicious! Best mac and cheese recipe that I’ve tried. I have to save some for my son. Can I freeze it and let him have it next week? I’m so glad you love it! Yes, you can freeze this mac and cheese. Just let it cool completely, and place in an airtight container in the freezer. Let thaw in the refrigerator for 18-24 hours, then let sit on the counter for bit to come to room temperature. Bake at 350 for about 30 minutes, or until bubbly and hot throughout. After reading lots of the reviews, this recipe seems to be the best ever. The only problem I have is that where I live we usually use grams to measure the ingredients. Do you by any chance have them in grams? I know I could find a way to convert but it might not be the same. Thank you for your prompt reply. How can prepare half and half? I have checked online: is it just a mix of milk and creme fraiche? Ill have to check in our stores if we have that kind here. Half & half is half whole milk, half heavy cream. This looks so yummy and I want to make it right now. I really like to add finely diced onion and a little pepper jack to my Mac and cheese recipes but I don’t think 15 or even 20 minutes in the oven is enough to time for the onions to cook through. Any suggestions? Could you add Chorizo to this and would you need to do anything differently? I want to make this for our Christmas party. I would need to make 4 batches, so you think I could put it in a roaster??? Hi Debbie, I’ve never made the recipe on that scale before, so I can’t say for certain if a roaster would work. It probably will, I just can’t guarantee it. A truly wonderful recipe! A family favorite! I never write reviews but I just had to for this one because my entire family loved this, and I have one insanely picky eater. For my husband and I’s half, I topped it with crushed kettle brand jalapeño chips and it was delish! I baked at 350 for about 18 min. If you’re looking for a great Mac n cheese recipe that everyone will like, stop searching and make this one! Really good! First mac and cheese recipe that I have ever bookmarked! I made it exactly like the recipe says, I added panko and butter to the top. Next time, I will personalize it! Thanks for sharing a great recipe! Can you use rotini pasta for this recipe? I just made this for dinner, it was a big hit with my boys. I made it with smoked gruyere (because that was the only thing I could get my hands on) and sharp cheddar, but it was so good. I’m planning on making it for Thanksgiving. Thank you for the recipe I cannot wait to make it again. Amazing the whole family loved it! First of all… THIS RECIPE WAS SOOOOO GOOD!!!! Omgoodness. My kids loved it, my mom loved it, and I loved it! This will be the only way I make Mac and Cheese from now on. I was totally not a Mac and Cheese eater because usually it’s dry and not cheesy… but this one was GREEEEAAAAATTTT! Hi Kristel, it’s 8-10 servings, unless it’s being served as a main course, in which it would be about 6 servings. Can I just use the bags of already shredded cheese? Or does the block cheese being shredded taste better? I’m going to try this recipe, and hopefully make & take it to thanksgiving for my family! Hi Bev, you can use pre-shredded cheese, but personally I don’t recommend it. Pre-shredded cheese is coated with cellulose to keep it from clumping together, and that can make the cheese not melt as well into the cheese sauce, unfortunately. I am a mac & cheese addict. This is by far the best that I’ve made or had. When cooking the cheese sauce, it could look like something has gone wrong when the cheese starts to melt and pull together like a sticky glob. Not to worry! Keep cooking and stirring on low heat (I added milk and 1/2 & 1/2 as I needed). until it is smooth and creamy! This recipe totally filled a 9×13 dish. I am happy that I placed my dish on a sheet pan lined with foil because it definitely ran over (mostly oil from the cheeses). Of course, that made it less fattening & greasy too! I also added about a tablespoon of smoked paprika and used gouda as one of my cheeses for that smokey taste. The top was crusty, inside very moist & cheesy. It sliced instead of being runny and it was soooo good! I found my love, this is it for Me! I can’t wait to make this in a couple of weeks! Hooray for a gorgeous recipe with glorious reviews! 🙂 I wondered if you’ve scaled this to feed groups at all? I’m serving this as a side dish for a group of 25 (relatively heavy eaters) and I’m trying to decide if I could double or triple it and bake in a large hotel pan, or if I should make single batches of the recipe and bake each in its own pan? Thank you!!! Okay! Thank you so much for the reply!! I know my team will adore this! You should try it bbq’d!!! Smokey flavor is added bonus and is super unique!!! That is totally on my list to try soon! We just got a smoker a couple of months ago, so I’m excited! My husband loves to smoke things. Would you make this ahead then just place the finished product in the smoker instead of putting in the oven to bake?? Wow! Just WOW! This makes the best cheese sauce base for homemade mac & cheese I’ve ever had. We layered some fresh cooked crab and used Panko bread crumbs for the topping 😋. We didn’t have half & half or heavy cream and I didn’t want to make a drive into town just to get some so we used almond milk (unsweetened) instead, a little extra flour and it still made a beautifully smooth roux for the cheeses we added (cheddar, jack and cougar gold – a locally made hard white sharp cheddar). If you use Hoffman’s super sharp it will prevent the grainy effect … its a processed cheese like American or a velveeta but for some reason their cheese doesn’t taste fake or processed whatsoever. I didn’t even realize the first couple times I used it that it was a process cheese, it’s literally that hard to tell. They sell it at Walmart in 8 oz blocks but it’s normally located by the deli and not in the in the regular cheese section. How do you keep the sauce from getting grainy? Is there any specific brand of cheese I should use? Hi Megan 🙂 It sounds like your cheese separated during the cooking process. Completely melting the cheese into the milk mixture will help reduce the probability of a grainy sauce. I’ve used a number of different cheeses, and while I love a good sharp cheddar, it’s notorious for not melting as evenly. Perhaps try a mild cheddar, or even swap out part of the cheddar for American or Velveeta. Those cheeses have added emulsifiers that help keep a sauce together. This was a great recipe! I noticed calories was 635 I believe. What is the serving size? 1 cup? Hello, I used your recipe but I added 1 1/2 cups ricotta cheese; I put it in after the milk/half and half. It melted nicely. My sister and I could not stop eating it. This is the best recipe for Mac & cheese I have ever made. I have already sent it to all the women in my family (28). Thank you for sharing. This is the best Mac and cheese recipe I’ve tried yet! I used sharp cheddar and Swiss cheese in mine. Delicious! Recipe is the best I have made…Thank you!! I’ve made Mac and Cheese in the past but this was by far the beat recepie I’ve ever gotten my hands on!! Everybody was more into the Mac then the main dish! I would give it 10 stars if I could!! Thank you so much for the recipe!! Would Habenero Monterey Jack work (in addition to Sharp Cheddar)? Thank you so much for your response! Our daughter is shredding the cheese, as we speak! Thanks, too, for the video! Made this special for kid going off to college tomorrow. It was a big hit, thanks. Hello! I’m making this for a potluck today… I know you give the make ahead directions, I’m just wondering about how well it stays. After being refridgerated, will the oils separate like they would for leftovers?? And after sitting, will the cheese sauce be pooling in the bottom?? I’ve never had that problem, but I wouldn’t make it more than one day ahead. Forgot to mention- I only had sharp cheddar and I also used cavatappi pasta (my fave!). Trying this recipe tonight! I have never used gruyere cheese so I’m hoping everyone is a fan! Thinking of adding some mozz too! In the UK we do not have 1/2 & 1/2. It’s that simple. (I only know what it is as I lived in the mid-west for 15 years)…. I always subbed single cream for 1/2 n 1/2 – worked great. I made this tonight, added some sauteed onions, a bit of garlic, chopped bacon, and ham to make it a whole meal. For cheese, I mixed cheddar, gruyere, and pepper-jack. OUTSTANDING. The steps were very clear and worked out great. The taste was amazing. Thank you. A lot of times, homemade Mac & cheese comes out dry, without the creaminess and sauciness of the Kraft box (which is all my daughter will eat. Yours came out GREAT. Will do again and will try other combos and add-in too. Very versatile.